Contrary to popular belief, the business world is not that complicated. While every industry and every profession requires specific expertise, the truth is that the "business of business" is relatively simple. For the past seven years, Geoffrey James has written a daily blog that's become one of the most popular business-focused destinations on the web. 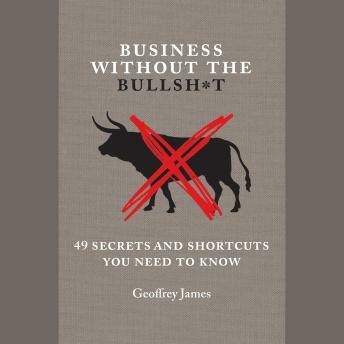 In BUSINESS WITHOUT THE BULLSH*T, readers will learn surprising but tried-and-true secrets about being an extraordinary boss, about coping with annoying coworkers, and navigating the thorny problems that recur in every workplace. TIPS FROM BUSINESS WITHOUT THE BULLSH*T: Long work hours mean less work gets done. Multiple studies reveal that working 60 rather than 40 hours a week makes you slightly more productive but only for a little while. After about three weeks, people get burned out, get sick and go absent, and start making avoidable errors. What every boss wants from you. From your boss's perspective your real job is to make the boss successful. There are no exceptions to this rule. Why your resume is your enemy. Only write a resume after you're talking to people inside the hiring firm. Then, customize it to match what you've discovered that they really what.